I have not written much in recent weeks. Way too many other people writing far more interesting things than me about important issues. I add the following as a placeholder for a later entry. 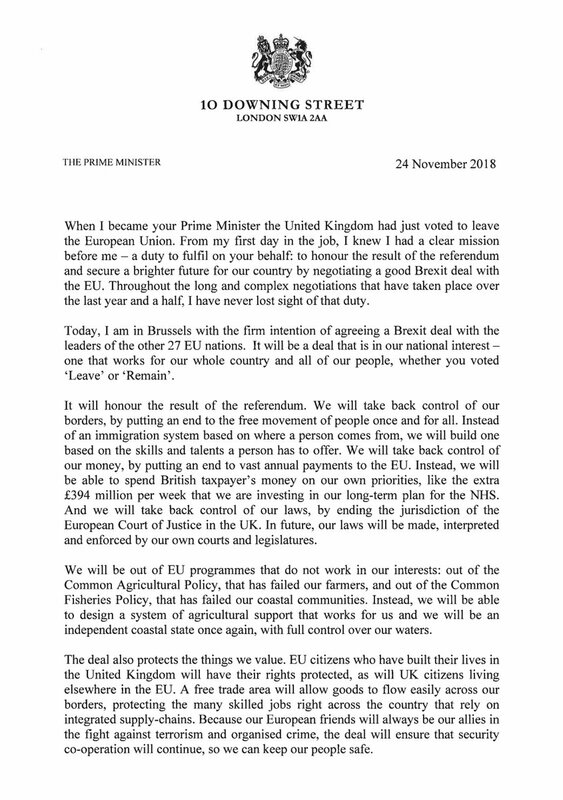 I’ve never received a letter from the Prime Minister before. So, I could hardly contain my anticipation when it arrived in my Twitter feed this morning. I should have known better. I honestly read it aghast. OK, I have not read the 500 pages of the withdrawal agreement. I have left that to others, such as Tory MP, Grant Shapps. But I have read a lot about it from those who have and, who, I trust. As I went through the letter, I was waiting for the first truth to emerge, but I was disappointed. There were no truths. Even the Brexiters, like Dominic Raab, are coming clean and saying that this withdrawal agreement is poor in comparison to the only remaining option; i.e. remaining. But the PM borrowed again from Trump: put sugar on it to make is seem appetizing. The best critique/demolition job that I have found is here: Steve Bullock. So there we are looking for breakfast. We end up at Schwedenplatz. We cross the Donau Kanal using the Schwedenbrücke and stumble into Spelunke on Taborstraße. It is one of those cafés that doubles as a nightclub. Versatile. But as we have found over the years, the proof is in the toilet, and Spelunke is special. The breakfast was ok, too. So, the first challenge is to get in. Because one does not expect to find instructions on the floor, the tantalising glass door just refuses to open. It takes a couple of helpful women to point out the floor sensor (above left). Once in, there’s more going on. 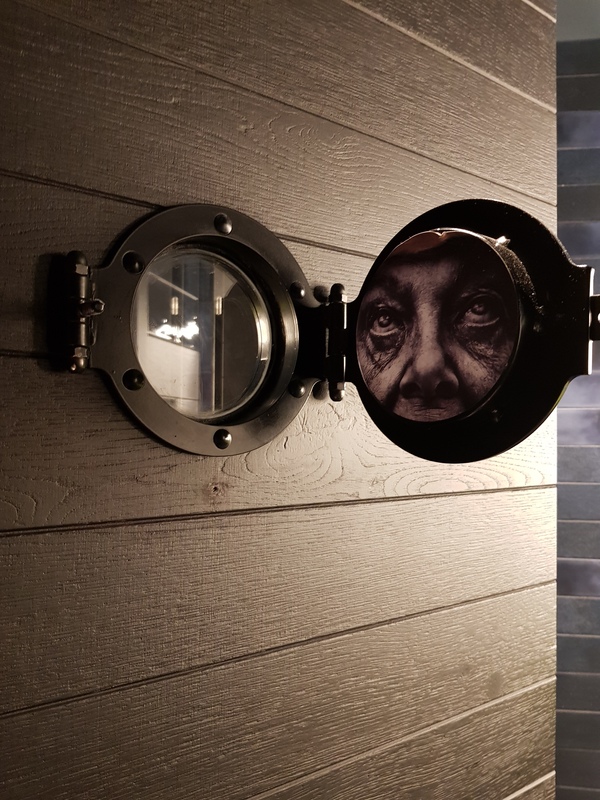 Now I did not go into the women’s toilet, but my partner came out with a couple of interesting shots from inside a cubicle where the portal window has a couple of surprises (left and right). 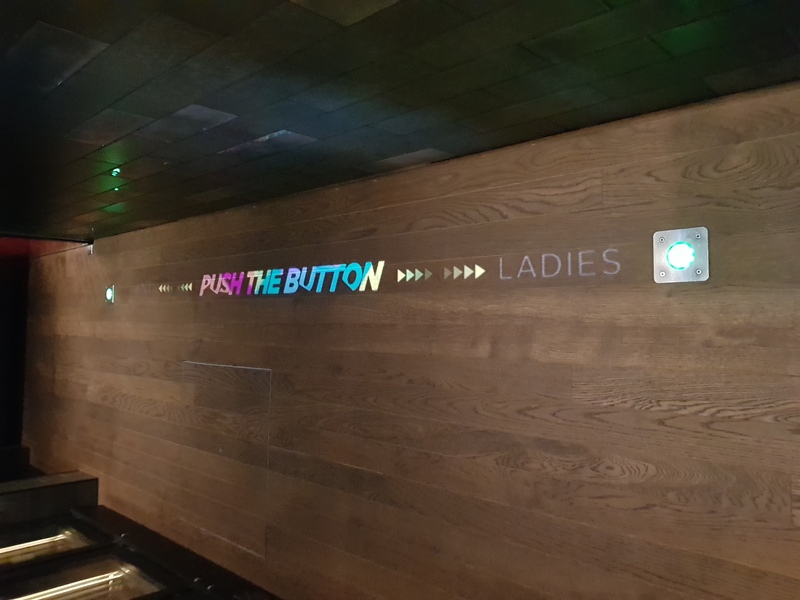 And just in case you cannot find the loo roll, it is illuminated. So the next day, we are after breakfast again. We concede Stadtcafé adjacent to Freyung, a rather central location. 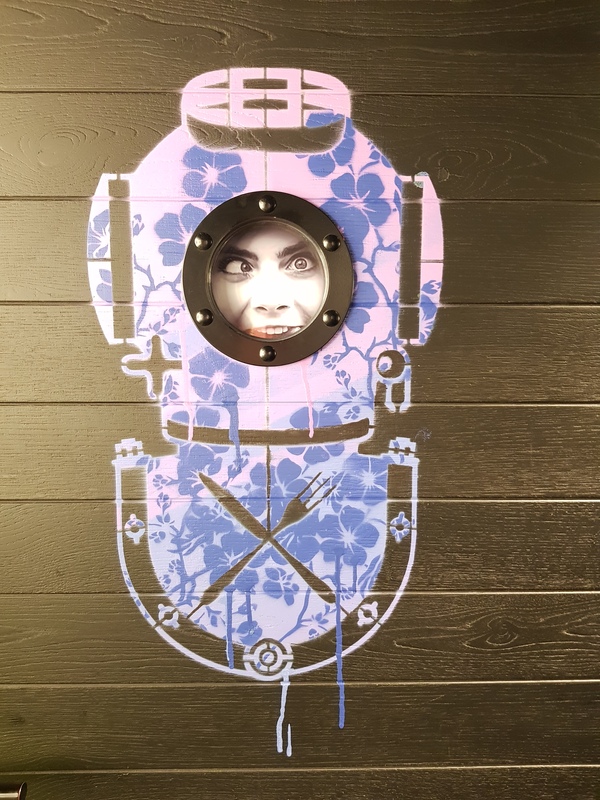 The café is pretty regular. The porridge was good. Then in the toilet one finds another mysterious piece of equipment, albeit designed by Dyson (right). 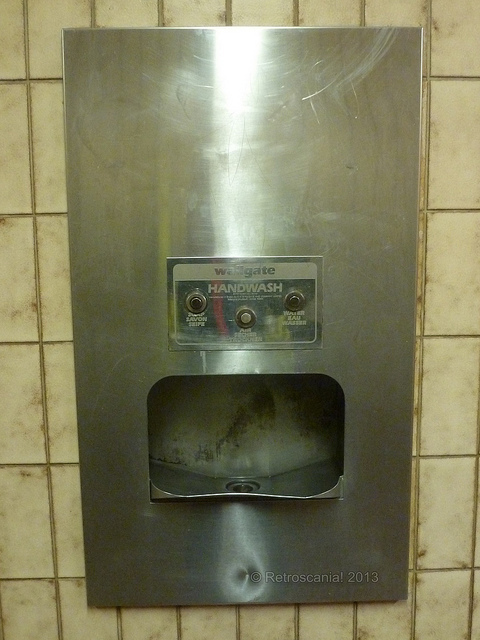 These three-in-one contraptions never seem satisfactory and always challenge. 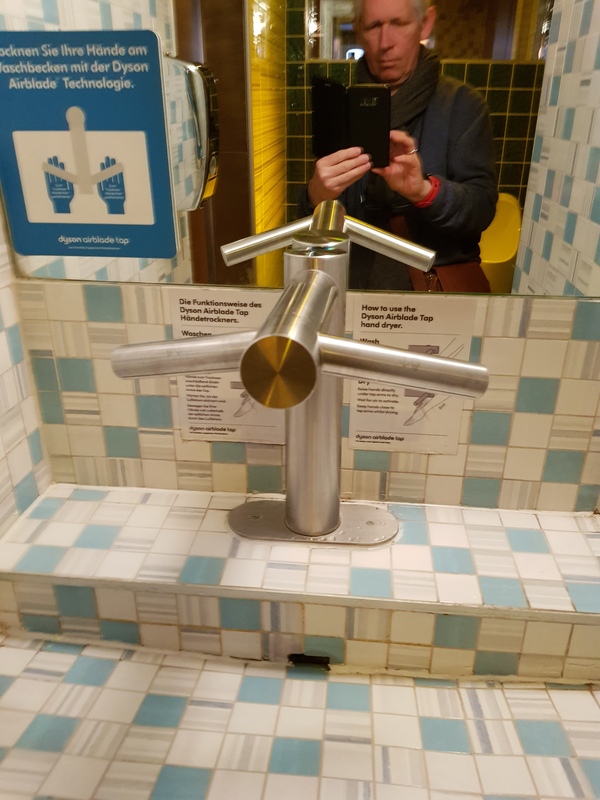 The wash basin itself is a bit of a mystery. It is more of a drainage channel. As a design idea, this borrows directly, I think, from the old ghastly Wallgate three-in-ones that seemed very popular with English public authorities either building or refurbishing their public conveniences (left). Since getting back from holidays in the Alps in August, it has been quite busy. The start of an academic year is always busy; this year had its own challenges. And they are persistent. Apologies to my readers. Something had to give. 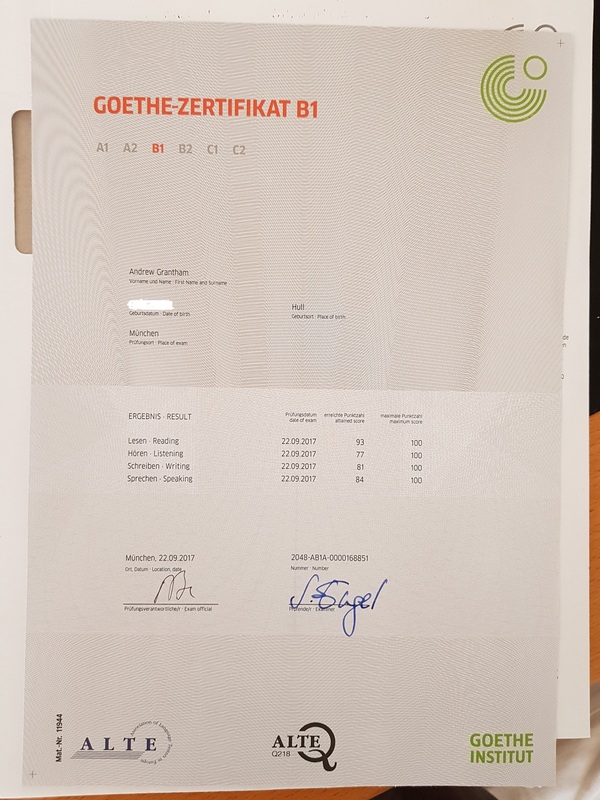 I have, however, now passed my Goethe Institut B1 German exam. It was quite an experience. I have not taken a formal examination for maybe 20 years (since completing my undergraduate degree). So, I had to prepare. The Goethe Institut offers plenty of mock examination materials for that purpose. I have spent the best part of a year trying to improve my mock scores. Examinations are as much about technique as they are content. Answering the question helps – though because the questions and/or instructions are in German, that makes it a shade more tricky to get right. I practised hard answering questions alone and with my tutor. I have to say that I thought – confidently – that I had failed the listening part of the examination. In my training, this was my weakest discipline. One has to listen to a cod radio-discussion programme and identify who said what. There is little concession to speed. Some of the voices seem similar and, as was in my case, in the first instance, I had no idea what the theme was! But somehow, I passed that part with a creditable 77 (84 overall from four disciplines). Anyone is doing this examination in Munich, be advised that the online “pass checker” tool may not work. After two weeks the Institut wrote to me to ask when I was going to pick up my certificate! And against their own guidelines, they sent it to an address in Munich for me to retrieve rather than have to attend in person. At 200 Euros, it is not a cheap option. But I am unexpectedly proud. 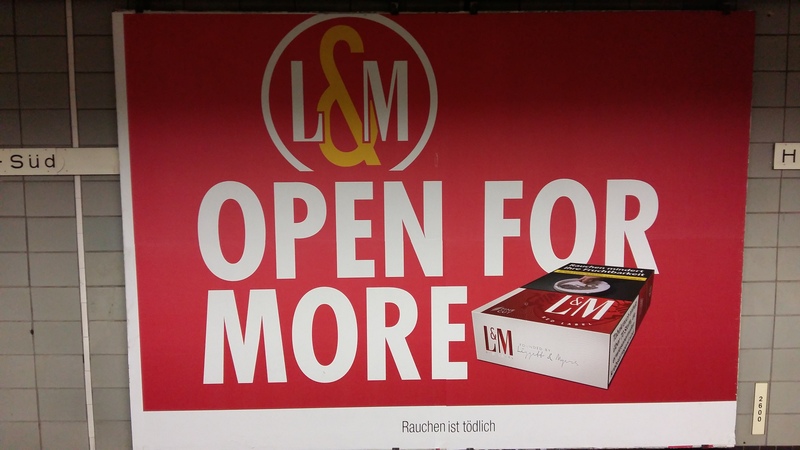 L&M is b ack on the streets with a new campaign and image. There are two posters at the moment, one red (left) and one blue (which I do not have the image for – I’m trying). I suppose it is just a play on words – the packet has more in it? The sharing options are more with L&M? And, naturally, open for more ways to die. Badly. 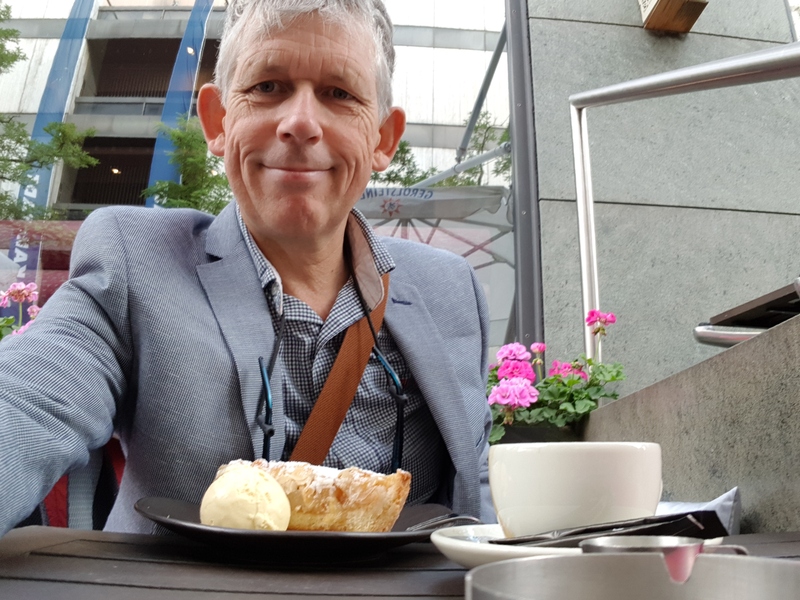 A few weeks ago I wrote a piece on the UK government’s assault on schools in forcibly converting them into Academies and then, by default, passing them, their assets and their curricula over to the private sector. Seemingly, there has been a lot of opposition to this, not least from local authorities whose schools they are. 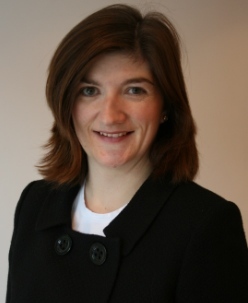 Nicky Morgan, the education secretary (left) for England told the UK Parliament on Monday that she is listening. So the new idea is to force schools to be academies, but for local authorities to manage chains of academies. Best of both worlds, it seems? Hang on a minute. One of the objections was cost. Conversion costs money. So far, £32.5m has been spent on conversion. Another £100m is required to finish the job. So no. Second, conversion is the precursor to privatisation. Schools cannot easily be privatised without conversion because, presumably, ‘academisation’ is just converting the school into a bundle of assets and contracts. The kind of stuff that private companies understand. So, even if in the short-term, local authorities run academies, it is the conversion that is critical. We must ask ourselves why this is a suitable compromise for an ideological government. Because it is the academisation that they want. Eventually they will be sold/passed on to their friends to make risk-free money from. Naturally I thought the point of advertising was to sell products. So, use beautiful people doing interesting things in the sunshine. Clearly, I am no marketeer. However, I need some guidance on the logic of Marlboro’s latest use of a raddled old man lighting up a cigarette (left). 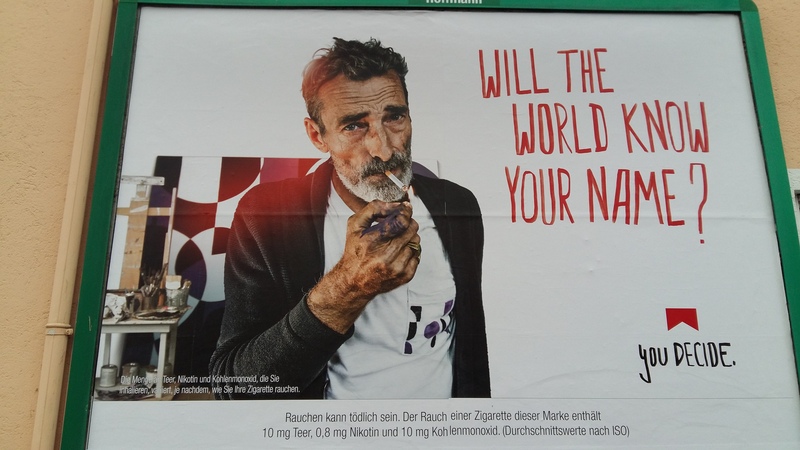 As for the strapline, will the world care what your name was (assuming he does not have too much life left in him)? No idea! 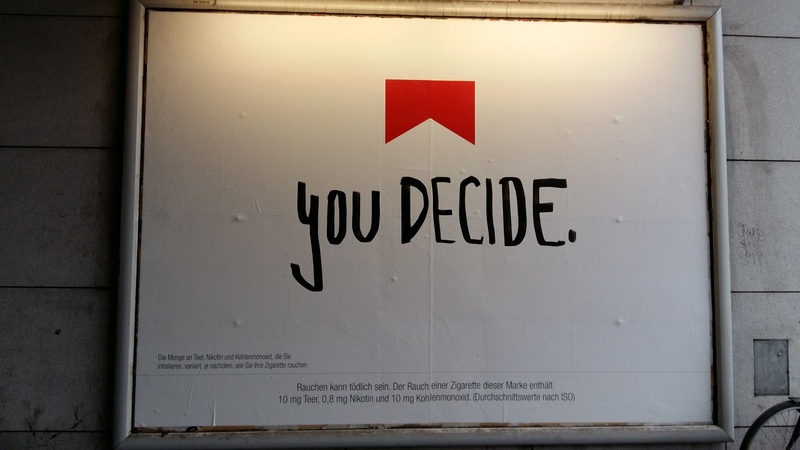 Marlboro has another You Decide poster current (right). This is more like it. Handsome, fit, bearded man with cigarette looks into the camera. 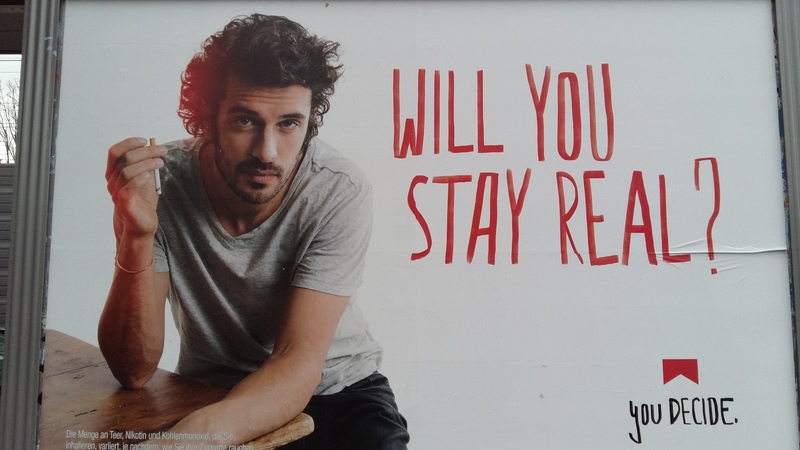 Another seemingly meaningless strapline, ‘Will you stay real’? ‘Will you turn into the raddled old man?’ strikes me as being more appropriate. A few weeks ago Marlboro started posting up their blank You Decide. posters (left) in that marketing ruse to spark interest. You Decide. what? An urban mystery that is compelling. The next installment is then eagerly anticipated. 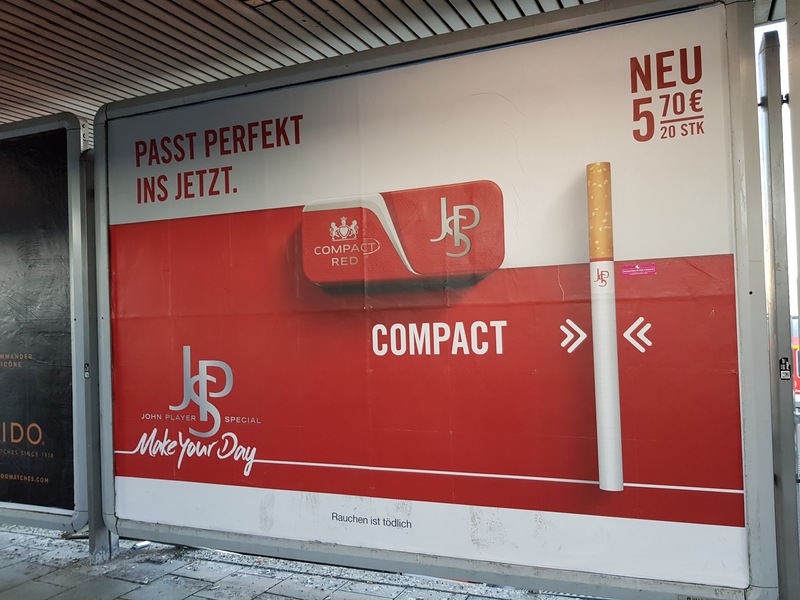 The theme is now developing well across Germany and presumably other territories where cigarette advertising is still permitted. Here are two examples. 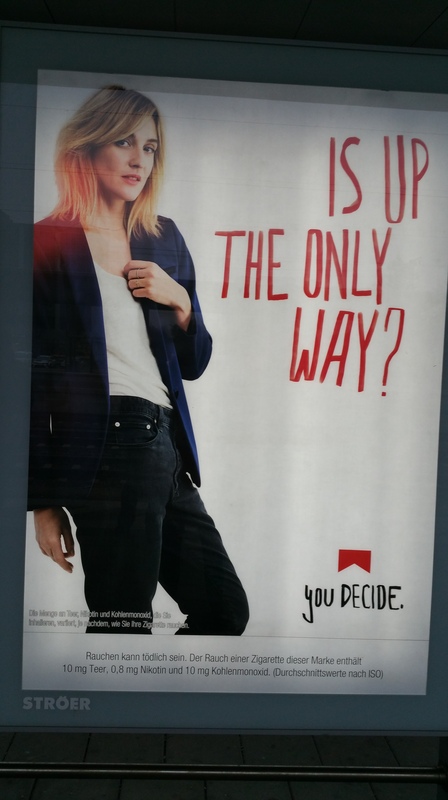 First, we are asked “Is up the only way?” in hand-written red letters. An image of a mature blond-haired woman accompanies the slogan. 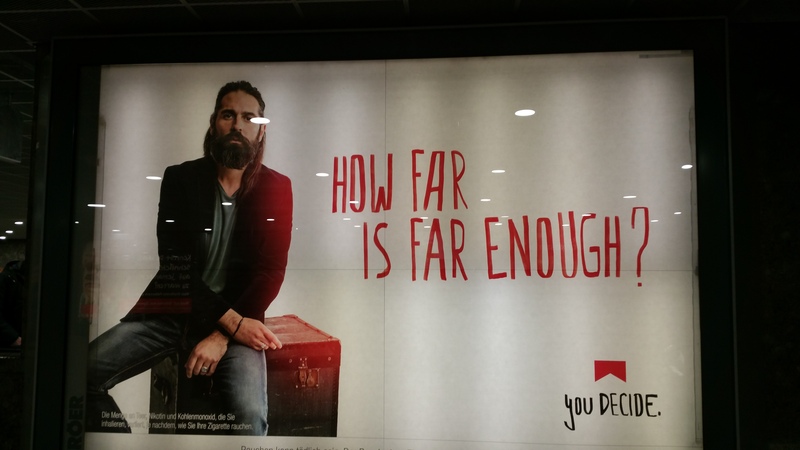 Men, by contrast, are asked “How far is enough?” in similarly fonted writing. The man is modern urban figure courting a beard and sitting on what seems to be a wooden box. OK, this is an unfolding narrative. There are more to come, for sure. Though, let me re-iterate, there is only one direction for smokers and this point is far enough. Quit. Camel’s more recent advertising campaign has celebrated its lethal qualities with primary colours and brand. With the “New Red and Blue” marketing it is back to the simplicity of presenting the product to camera. A man in a checked shirt holds a packet exposing the logo to the camera. However, it seems that the marketeers have not been following this blog. 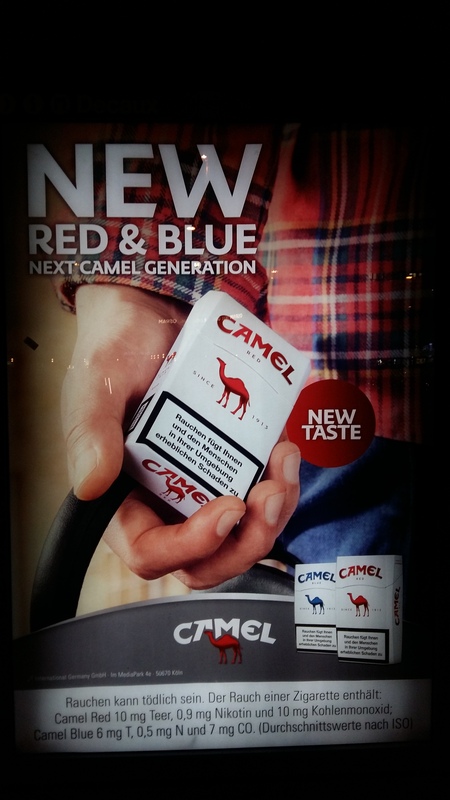 The strapline “Next Camel Generation” beckons my normal scorn. Has the previous generation succumbed to cancer and heart disease?